I was sixteen on the date above and the story below tells you what happened to me on that day. At fifteen, she sits in the dark making a chair out of the hood of someone’s car. Old and white, it belongs to a boy whose parents wanted a newer model. At least, that’s what she thinks now. At fifteen, she doesn’t drive yet and while cars mean freedom, she’s in no hurry to take the wheel. It’s as if she knows that when she’s sixteen, she’ll crash her first car driving too fast in the rain. When the police question her, she’ll say she was only going forty because that was speed limit going into the curve. She’ll shrug when he points first to the place where she left the road and then to a group of trees in the distance. “Those trees are two-thirds the length of a football field from where you first lost control” he’ll say, and then he’ll wait as if he thinks she has a different story for him. “Maybe, I hit the gas pedal instead of the brake…” She’ll offer this up as a potential explanation and hold firm to this possibility. Her dad and stepmom will both come to the crash site, and after hugs all around, she’ll go home to an ice pack and a place on the couch for ease of observation. She’ll know she was lucky that day. No seatbelt, airborne in a steel tank of a 69 Ford, she’ll remember the uncontrolled lift off of her body as it slammed forward hitting the glass while struggling to find an opening in the tiny space between the windshield and the broad dash of the old car. She’ll never forget the windshield holding firm as her body left its place behind the wheel or the feel of the impact with the trees that ended the free flight of her first vehicle. She’ll hear on the news later that day that the King is dead. She’ll think about the crying mass of people at Graceland and wonder about why he died and she didn’t. But for now she’s only fifteen, sitting on the hood of that old car, caught unaware by an impromptu portrait artist with a Polaroid camera. If she knew, she would be smiling. She’d look directly at the camera and paste on a happy face. Hiding her questions, her doubt, and her childhood sorrows behind a smiling mask of good teeth and the unlined face of fifteen year old, she’d light up on cue when prompted. 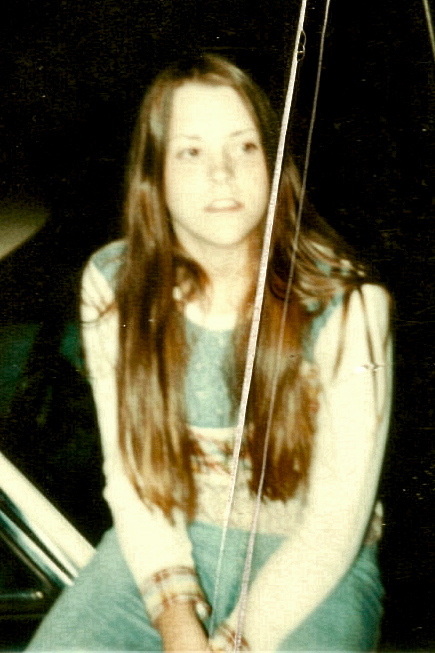 She’ll remember a lot about fifteen, but she won’t remember this night or this picture until it shows up 33 years later in something that will be called an email from a boy who took her on a road trip of hope, at fifteen. Many thanks to JL for saving an old memory and passing it on. * This is a repost from October 19, 2008 but seemed timely given the anniversary the death of this man. This entry was posted in Memories, Unexplainable and tagged At Fifteen, Car Accident, Elvis, Ford, Graceland, Polaroid. Bookmark the permalink. I remember where I was when I heard Elvis died. San Antonio and I was just leaving work and one of the porters told me and I said to him that’s not funny! Also remember when the movie came out and my aunt took my sister and I to the movie in Toronto. Glad you lived to tell the tale….what can I say??! What a beautifully written memoir. I could visualize the whole thing and I love the perspective you gave it from your 15 year old self. How fortunate you were to survive such an accident and how fortunate we are to be able to read your eloquent prose.